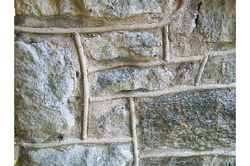 In the interest of old-world craftsmanship, allow me to explain how to apply/repair ornamental mapping on historic field stone (rubble stone) construction. Many historic field stone walls and foundations you see dressed up with what Stone Masons refer to as 'Ornamental Mapping' or 'Stone Beading.' This process involves outlining the stones with a raised concrete border. This adds both depth and definition. Ornamental mapping, a common practice in the late 20's, early 30's. 1. Lay out a diagram just where you want the mapping to go, before preparing your cement. Use a nail or the Jointing tool to scratch a trail between the Field Stones into the concrete. This also provides a roughened/etched surface for the new concrete to bond. 2. Mix concrete and bonding adhesive 2-1, keeping a lid on the bucket to keep it moist during application. This stiff mix should adhere and stay in place. Add a very small amount of water, if the mix is too dry and crumbly. 3. Use the spray bottle to lightly dampen the etched trail just before applying the bead. This will assist in the bonding process. 4. Dip the Jointer into the water bucket before loading it with concrete, to produce a smooth finish. 5. Scoop out a trowel full, load the concave Jointing tool and apply. Draw the tool backwards over the bead as you press it into the foundation. A simple process, really. But the end results are worth it! Once you have your rhythm going, you will progress fairly quickly. * f the concrete mix is too dilute, the bead will sag and fall off. * If the concrete mix is too dry, the bead will crumble and fall off. * If the mix is just right and applied correctly, the bead will last decades! * You can add color stains or translucent color enhancers to assist in matching your mix to the original mortar. * If your mapping is an exact color match to the mortar between the stones, the detailed feature may be lost at a distance. * Once your mapping is completely cured, consider applying a masonry water proofing spray or brush on sealant to reseal your foundation against moisture infiltration. * Since publishing this article, I have observed that this type of decorative ornamental mapping was a prominent feature of stone walls in the world's longest-running sitcom, 'Last of the Summer Wine,' filmed on location in Holmfirth in West Yorkshire, England. * Working with concrete will dry out your skin, consider wearing latex gloves.